In the early days with baby, milestones seem to come around far too quickly. Sitting up, rolling over and crawling seem to arrive and pass in the blink of an eye. However, when it comes to walking, it can feel like it’s taking forever for baby to take their first steps. It’s important to remember that all babies develop at different stages. So, just because your little one has reached the age where they could start to walk, it doesn’t necessarily mean they will. Generally speaking, babies take their first steps between 12 and 15 months. However, some develop at a faster rate, taking their first steps at just 9 months old, while others may take 18 months to master the skill. Try not to be discouraged if your baby is taking longer to start to walk. It will come with time, but if you’re really worried there are a few things you can try to speed up the process. 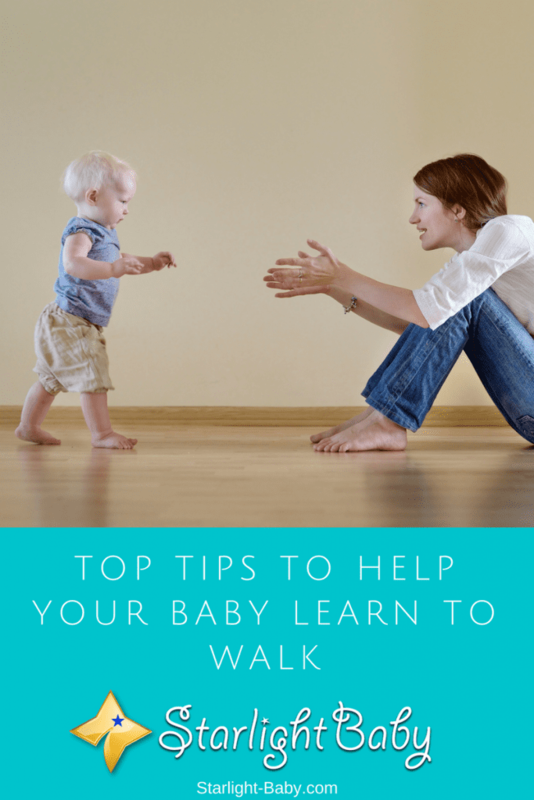 Here, you’ll discover some of the top tips to help your baby walk. It takes a lot of strength for baby to start walking, so it could just be they haven’t built up their muscles well enough yet. There are a few ways you can help with this, including making sure baby stays on their tummy for approximately half an hour each day. The 30 minutes could be broken up throughout the day if they don’t have the attention span or they simply don’t want to spend a consistent 30 minutes on the tummy. This clever tip can be used as early as a few weeks after birth and it really helps to build up not just the back muscles, but the neck muscles too. There’s also the additional benefit that it helps to prevent a misshapen head. You can also help build up baby’s muscles by showing them things which hold their interest. Moving objects around within their line of sight will also really help. It’s a common belief that the leg muscles would be the ones which need to be built up, but it’s just as important for the neck and back muscles to be strengthened too. At one time, walkers were the go-to product to help encourage babies to walk, but they’ve recently come under fire for their potential negative side effects. If you’re worried about using a walker, a good alternative is a push toy. These don’t constrict your baby, so they will help your little one strengthen both their arm and leg muscles. Think of toys such as pretend vacuum cleaners or even lawnmowers which your little one has to push along. Another added benefit of these toys is the fact that they help with balance too. This is because they encourage baby to use a wider stance than usual. They’ll also help develop essential walking skills, such as having to back up the toys, or turn them around corners. You can also encourage them to walk over to you while they’re using the toy. This gives them a focus and you can gradually increase the challenge y moving further away. Don’t forget to praise them enthusiastically when they do make it to you too. This will make them want to do it even more! If they’re struggling to get passed the crawling stage, one way to help is to start placing toys further away. They may still need to crawl towards them, but as they start needing to crawl further to reach their toys, it’s going to build up those muscles. If your baby is fine pulling themselves up and walking along holding furniture, you could help by teaching them how to bend their knees. If they haven’t mastered this yet, it could be one thing deterring them from walking. This is because without bending the knees before they go back down to the floor, it could be traumatic for your baby. The hard fall can make them think twice about getting back up again. So, teaching them how to lower themselves down gently by bending the knees, can make a massive difference. If your baby can stumble a little, helping to support them while they take those first few steps can really help boost their confidence. Don’t try and go too far, just start off with a few steps at a time. You’ll soon find your baby starts holding their arms up towards you for you to help them go for a little walk. With this tip, the key is to practice. The more you do it, the more confidence baby will get and it will become more like second nature. One thing that can deter baby from walking is if they try to hold onto something and it falls over. So, make sure any furniture they’re likely to use to pull themselves up and support their weight as they walk along, is firmly stuck into place. It’s also a good idea to make sure there’s a nice, cushioned landing spot next to the furniture just in case they do topple over. If your baby can take some steps by themselves, it’s a good idea to start encouraging them to use their legs more. So, when you’re putting them down for example, try to place them into a standing position, rather than a sitting down one. Overall, the main thing to remember is to be patient with baby. Walking isn’t always easy for your little one and children do develop at very different rates. So, don’t see it as a competition. The more practice your baby has, the more confident they’ll become. Are Baby Walkers A Help Or A Hindrance? Hi, I like your post is very informative. My son started to make his first steps around the age of 9 months. We were so excited and so happy when we saw him standing on his feets and make its first step….he fell immediately but that was not a problem and it didn’t stop him to try again. As Jane Lee said, a baby’s first step is a moment you will never forget. And we can learn from kids, too. As you said, the child fell but he/she tried again. I think as adults, we should remind ourselves of this when we encounter failures. Ah, that moment when your baby takes his/her first steps… Trust me, you will never forget it because it is such a beautiful thing. I can’t even put it into words. Ours began taking his first steps at 11 and half months. It was sooner than we expected but he always seemed very active. I agree with you though. Parents are often too expectant and want their babies to walk at a particular age. You have to accept that everybody is different. Kids develop differently and a different pace. Just because your child doesn’t begin walking right away that doesn’t mean anything bad. Just keep encouraging it and it will happen before you even realize. Another important thing to note; when the children start getting more active and you see them trying to walk a bit, make sure that they can’t hit anywhere if they fall over, like into a table. Very good reminder there, Jane. A home should be made an accident-free zone when there are babies or kids, especially when they’re already able to crawl or walk. Remove tables and any small items they could put into their mouth. And you’re right, kids develop at different paces. Some walk early, while others are early at something else like talking or teething, etc. This is such a special moment for every family! Even more if it’s your first kid, as it is in my case. I was so nervous about not knowing how to help him in his learning process of how to walk. Having this kind of information is so helpful. Thank you for sharing! Seeing a child to walk for the first time is a memorable event for parents. You feel accomplished because all your efforts preparing him/her for that day has paid off. Ironically, after we teach them to walk, we sometimes kind of wish they’re still babies that we can hold and take where we want to go, haha. you’re always on point.this is quite educative.with my last born,what helped him was a pushed toy and he loved pushing it around because of the bright colours and the sound on the toy. And again, I was always on my feet and he likes being on his feet too. So true, augusta. Once a child learns to walk, both of you should be on your feet because you definitely have to be behind him/her in case the child falls while still learning to walk properly. You have to be ready to catch him/her. The same thing is true if you put the child in a device that aids walking, like a walker or a push toy as you’ve mentioned. The joy of every couple is to take in successfully, deliver safely and for the child to grow healthily at a very rapid speed. I can still recall quite vividly, our second child starts walking effectively until he reaches 13months. When he was 10months old, my wife was panicking thinking what could have gone wrong, I always assured her that there’s no cause for alarm. The only thing I could remember we did was going on a 10minutes exercise daily with him in the park. I can still recall we both holding his hand’s side by side while he stays at the middle and we both move him gently around. This continues for several days, in the middle of the 11th month he took his first two steps alone and towards the end of 13months he starts walking very well. That little assistance you gave to them goes a long way. All the methods you described in this article are awesome and interesting. I enjoy reading them. Thank you for the wonderful comment, Gettingmile. Great to know you enjoyed the article. Indeed, it is unforgettable for a parent to see his/her child’s developmental achievements. It’s just sad that many parents miss a lot of their child’s milestones because they’re busy earning a living. Watching it on a video is way different from actually experiencing and seeing it. My baby is just three months old. However, by the time he is 12 months old, he might be walking. That’s when I will have to know how to teach my baby walk. From my experience of baby sitting for my sister’s kids, I have observed how a baby can be encouraged to walk. The trick is to bribe them. You will have to place food or toys little father from the baby and show them what’s there for them. The baby will be easily attracted towards food and toys and will take little steps. Since bright colors attract the babies, you can also try this with bright colored objects. Wonderful suggestion about the bright colored objects, vinaya. These will surely attract a child’s attention and encourage them to move towards the objects. I’m sure you’ve learned a lot about child-rearing when you took care of your nephews/nieces. You were able to practice ahead, haha. Now that you have your own child, you can put the things you learned into practice. My child is one year old now. He began taking baby steps with a support when he was 10 months. Hew can now stand straight without any aid for a few minutes, however, he is yet to walk properly. One of the ways that I have learned about helping the baby walk is by appreciating his actions. When you laugh, smile, pat, kiss, your baby will understand that his action has been praised. Encouragement plays a great role in the child’s learning process. All these tips are definitely going to come in handy for new expectant parents as they are still new to the dealings of taking care of a baby/toddler, they are truly going to appreciate any useful information that would help them get through each stage of their new baby’s life. I found the use of toys to lure babies to attempt to initiate movement in search of getting the toy. This takes time as babies or toddlers are quite scared at such young age but with time they would pick up courage and go get their craved toys. I felt touched reading this article for my uncle whose wife couldn’t have kids for so many years got twins and it has been more than a year and those kids couldn’t walk. Each time I pay a visit, I try to see if there are tips that can help to quicken the process. I’m grateful for this article for with the tips, I’m confident that my little cousins will start walking in no distant time. I will try to let their mom know about how to implement most of these tips. © 2019 · Kinacle · This page may contain affiliate links.